Boeing has confirmed its 787 Dreamliner will make its first flight in the final three months of this year. The plane is now about 16 months behind its original schedule and Boeing has blamed the delay on slow assembly progress and problems with suppliers. First deliveries of the plane are now scheduled for the third quarter of 2009, Reuters reported. Boeing's rival Airbus also suffered delays and production problems with its latest plane, the A380 superjumbo. Dmitry Krol, director of communications for Boeing in Russia and the CIS, said there was no change to the schedule announced in April and confirmed the aeroplane would make its maiden flight in the fourth quarter of this year. The company clarified its schedule after an executive said the plane would fly by the end of summer. Japan's All Nippon Airways was expected to receive first delivery of the plane in early 2009. The new model is being touted as vital to securing the company's financial future. It is thought the Dreamliner's claim to fuel efficiency will be an advantage as oil prices continue to soar. The Dreamliner uses technology that allows much of it to be made of plastic composites instead of aluminium, which means it is lighter and, Boeing claims, will consume 20% less fuel than other, similar-sized planes. It also has a greater range than similar-sized planes, which Boeing hopes will mean it can open up new, direct long-haul routes. This strategy is in contrast to the new Airbus A380, which also suffered from considerable delays before it finally entered service in October last year. The A380 is designed to carry larger numbers of people between hubs where they can change onto smaller aircraft to reach their final destinations. Airbus is also developing a direct competitor to the 787, the A350XWB, although that is not scheduled to go into service for another five years. 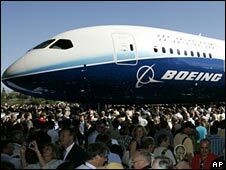 Boeing received 802 orders for the Dreamliner by the start of 2008, making it the planemaker's fastest selling model. It will be Boeing's first completely new aircraft since 1995.